We’d love your help. Let us know what’s wrong with this preview of Interrupting Silence by Walter Brueggemann. To ask other readers questions about Interrupting Silence, please sign up. Brueggemann's latest has plenty of good ideas, but it feels inessential. It's a short read, and it feels very casual. These are ideas Brueggemann knows inside and out by now, so while he's clear and concise, it's a little rote, even if his points – primarily about the value of speaking out and creating a space to speak – are valuable, particularly in our current moment. I'm suspect of a few of his readings. While it can be useful to make a character stand in for Rome/oppressive powers, sometimes Brueggemann's latest has plenty of good ideas, but it feels inessential. It's a short read, and it feels very casual. These are ideas Brueggemann knows inside and out by now, so while he's clear and concise, it's a little rote, even if his points – primarily about the value of speaking out and creating a space to speak – are valuable, particularly in our current moment. I'm suspect of a few of his readings. While it can be useful to make a character stand in for Rome/oppressive powers, sometimes that's a stretch of the biblical story. His reading of the story of the Gentile woman in Mark 7 misunderstands (misrepresents?) Jesus's activity in it. That she “reeducated” Jesus is an unnecessary stretch to make politicized point. That, at least as I read the chapter in Mark, he has the setting wrong makes it less convincing. Fans of his work might enjoy it, but probably won't find as much new ground as they'd hope; newcomers will find it to be a quick and accessible read. It might make sense as a part of a group study/conversation rather than as a pivotal work in itself. WOW! My first time reading Walter Brueggemann, and extra special to share the experience with the wise, beautiful women in my small group (one of whom studied with Brueggemann in seminary). This is a small book, but it's full of powerful and timely topics. Highly recommend as a group read because you will need to discuss it! A work that encapsulates both the compelling and frustrating natures of Brueggemann and his work. Over the first seven chapters Brueggemann incisively explores narratives in the Old and New Testament as they relate to breaking silence. He considers the cry of the Israelites regarding oppression by Pharaoh; Amos' unwillingness to be silenced by the priest in Bethel; David's meditation on how an unwillingness to cry out to God for forgiveness and to keep silent hurts and kills; the Syro-phoenician A work that encapsulates both the compelling and frustrating natures of Brueggemann and his work. Over the first seven chapters Brueggemann incisively explores narratives in the Old and New Testament as they relate to breaking silence. He considers the cry of the Israelites regarding oppression by Pharaoh; Amos' unwillingness to be silenced by the priest in Bethel; David's meditation on how an unwillingness to cry out to God for forgiveness and to keep silent hurts and kills; the Syro-phoenician woman's challenge to Jesus for healing; Jesus casting out the demon who made a boy mute; and Bartimaeus being quieted by the crowd but proving unwilling to be silent. In these chapters Brueggemann is often at his best, providing compelling exegesis and commentary, showing how God brings forth justice for the dispossessed and marginalized, although at times, as is often the case, he's stretching things a bit. And then we get to the last chapter, and ostensibly the point of the book: associating all of these earlier episodes about silencing as oppression and applying it to women preachers in light of 1 Corinthians 14:34-35, and how such is a similar type of silencing. And so the book really becomes a means by which a liberal progressive Christian attempts to show Biblical continuity in making such a claim. In so doing the rest of the book loses a bit of luster, and questions arise about the selective choice of silence. Silence is not merely an oppressive tool; Habakkuk summons all to be silent before God in His holy temple (Habakkuk 2:20), and there is silence in heaven when the seventh seal is opened (Revelation 8:1). The argumentation in the final chapter often begs the question. As is consistent with the theme, Brueggemann would have us read all of the NT in light of Galatians 3:28, never mind that Paul shows no inclination elsewhere to flatten or deconstruct the roles and positions mentioned in the verse. Ephesians and Colossians are of course right out as not truly Pauline; he has to except 1 Corinthians from his discussion of how Paul views women, and whenever some evidence has to be excluded, you have to wonder why. Even if you're tempted to agree with his reasoning, you can hopefully see why there remain strong arguments against it. The book would have been quite compelling without the final chapter; then again, without the final chapter, it would likely not have been written. In the end, therefore, a bit disappointing. Walter Brueggemann, Professor Emeritus of Old Testament at Columbia Theological Seminary, & an ordained United Church of Christ minister, gives us a refreshing, provocative & down-to-earth reflection on the dynamics of silencing & speaking out to end silencing. Silencers throughout human history are those who, whether in religion, politics or society in general, coerce economic production -- by the poor, the less fortunate, the weak. They act out of fearful greed, imposing stringent Walter Brueggemann, Professor Emeritus of Old Testament at Columbia Theological Seminary, & an ordained United Church of Christ minister, gives us a refreshing, provocative & down-to-earth reflection on the dynamics of silencing & speaking out to end silencing. Silencers throughout human history are those who, whether in religion, politics or society in general, coerce economic production -- by the poor, the less fortunate, the weak. They act out of fearful greed, imposing stringent demands on a vulnerable labor force, and they make their claims to be absolute to perpetuity. Anyone who dares to speak up, disagree or confront such policies is vehemently opposed, put back again in their "place", shunned, discredited, attacked, sometimes killed. Using texts from both the Hebrew & Christian Scriptures, Brueggemann gives examples & discusses them in light of the above ideas. I found Chapter 4, "Jesus Rudely Interrupted", from the Gospel of Mark 7:28, to be particularly enlightening. 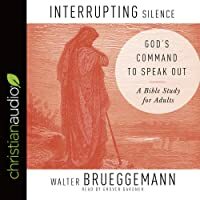 A brief yet fascinating study from Walter Brueggemann on the place and power of silence - and the act of silencing - in the Christian Scriptures that points out that at the heart of silence is the application of power a power that supports the status quo rather than the freedom that God proclaims. Taking several particular examples from across the spectrum of the Scriptures, Brueggemann issues a constant clarion call to recognise silence as something that has its origins in human frailty and desi A brief yet fascinating study from Walter Brueggemann on the place and power of silence - and the act of silencing - in the Christian Scriptures that points out that at the heart of silence is the application of power a power that supports the status quo rather than the freedom that God proclaims. Taking several particular examples from across the spectrum of the Scriptures, Brueggemann issues a constant clarion call to recognise silence as something that has its origins in human frailty and desire - a desire to not upset what is commonly understood as being 'the ways things are' - and the breaking of silence to be an act inspired by God - and enacted by Jesus in many of the examples cited - that challenges the status quo in preference to the fullness of what God intended. It is a challenging book - especially the last chapter where Brueggemann looks at the way in which the Church, as institution, can be as guilty as silencing the still small voice of the Spirit in order to preserve that which the Church believes to be 'the way things are'. For a white male member of the clergy, it was thought-provoking and challenging in ways that cannot be ignored and which will need to be considered prayerfully and honestly. I really liked the format of this Bible-study book. Instead of studying one book in the Bible, Brueggemann finds scattered examples in Scripture where people have spoken out. Each of eight chapters has a theme and Scripture passages to read and discuss. Several questions are posted at the end of the chapter. Thought provoking and easy to discuss. 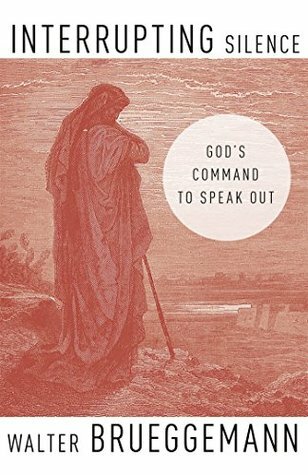 The title suggests that God commands speaking out and perhaps we should be doing that right now. Timely and short read on a topic that should be more thoroughly discussed and acknowledged in the faith space. It provides some good food for thought and nicely forms the biblical basis for some ideas I have been toying with. The many old and new testament examples were super helpful and I would definitely build on some of this work as a reference while speaking on topics related to #MeToo, Immigration and fighting for the defense of black lives as Christians. An important thing to note about this book is it is meant to be a study for church groups. The chapters are shorter and there are questions at the end of each chapter for conversation. I state this after reading some other reviews about the content of the book. It is meant as an introduction into a larger conversation which is meant to be had around the table. It is still a good read, but it is definitely designed as a study as it states in the book. This study has been such a helpful and thought provoking additive to sermon prep for me the last few months. I've been using the texts and studies to springboard my sermon study. The sermons and reflections have launched many great conversations around our congregation about what it means to speak up and bear witness to God at work in our lives, as well as call out injustice and name the privileged silencers around us. A great good for study, with a group or alone. This is one of the most prophetic, inspiring and damning books of our time. Brueggemann revisits the passage of the widow who demands justice and reveals the necessity of persistent voicing to bring about restoration and equity. Faith is a matter of persisting hope and silence breaking in the midst of silencers. The Church has played its own silencing role as an organization and institution, and this power needs to be broken as well. Bruggemann traces the idea of God's people being "silence-breakers" throughout the Hebrew Scriptures (Torah, Psalms, and Prophets) and in the life of Jesus. This feels particularly relevant in light of the recent US election as well as other social movements, such as the #MeToo campaign. Again, I would recommend this as a small group book for discussion or for an adult education forum. The book shows numerous examples from the Old and New Testaments where people spoke up against injustice, breaking the silence that allowed it. We are challenged to speak up for justice. If we don't, we are allowing the powerful to remain in control and unjust situations to remain the norm. With his usual clarity, Brueggemann tackles silence and its role in social justice. Using his typical socio-rhetorical method, he traverses both Old and New Testament passages to teach about silence and why there are times to speak up! Well researched and written. Brings new understanding to light. Some parts difficult. Recommend as a good read for thoughtful Christians. This is a good book for group as well as individual (as I used it) study. Brueggemann always helps us break out of old patterns so we can consider the world anew. There is a time for silence but, there is also a time to speak. This short book will give you food for thought about places and times you should speak up rather than remaining silent. The author tends to look through the lens of modern culture at the scripture rather than looking at our culture through the scriptures.